When immigration policy and the treatment of Roma collide in international relations there are surprising consequences which are revelatory of the underlying tensions between internal and external policies in the European Union. This book examines the relationship of citizenship, ethnicity and international relations and how these three aspects of the State, its people and its neighbours relate to one another. It studies the wide issue of international relations, citizenship and minority discrimination through the lens of the case study of European Roma who seek refugee status in Canada on account of their persecution in Europe. The volume assesses the relationships among citizenship, state protection and persecution and minority status, and how they can intersect with and destabilize foreign affairs. The central background to the book is the European treatment of Roma, their linkages with visa and asylum policies and their human rights repercussions . The various contributions reveal how modern liberal democracies can find themselves in contradictory positions concerning their citizens - when these are looking for protection abroad - and foreigners - in search of international protection - as a consequence of visa and pre-border surveillance policies and practices. Didier Bigo is Professor of International Relations (and MaÃ®tre de conférences des universités) at Sciences-Po Paris, France, and Researcher at CERI/FNSP. 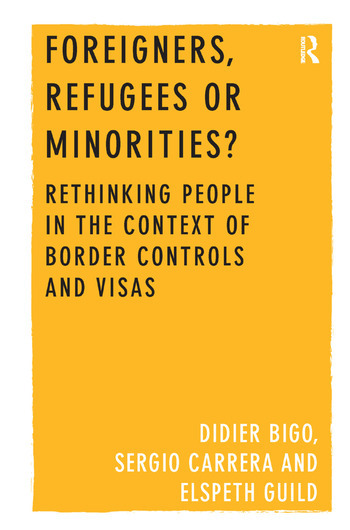 Bigo is also Professor at Kings College London, UK. Sergio Carrera is Senior Research Fellow and Head of the Justice and Home Affairs Programme at the Centre for European Policy Studies (CEPS), Belgium. Elspeth Guild is a Jean-Monnet Professor of European migration law at the Radboud University Nijmegen (The Netherlands). She is also Senior Research Fellow at the Centre for European Policy Studies in Brussels and a partner at the London law firm Kingsley Napley. She is a Visiting Professor at the LSE London and teaches in the Department of War Studies at Kings College London.